Directional signs, whether to tell you how to find the nearest restroom or how to get to a given land or attraction, are crucial to the flow of traffic in a space. Using carefully selected fonts and adding details to these signs enhance their attractiveness and allow them to seamlessly integrate into their environment. No park does this with more flair than Disney’s Animal Kingdom. Take, for example, this large directional sign that lives in the heart of Asia, near Yak and Yeti, Kali River Rapids, and the path to Expedition Everest. At first glance, it appears to be a collection of signs that have been bolted onto a lamppost, some of them in a rather precarious fashion. 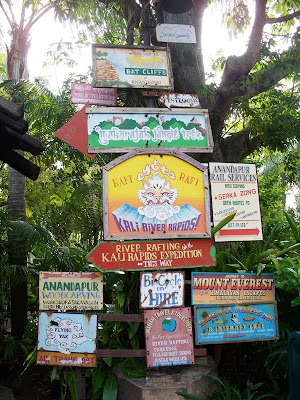 What makes these signs intriguing, however, is not the level of authenticity to signs found in real world Asian marketplaces, it is the mixture of locations found in the Asia of Disney’s Animal Kingdom and businesses created to further the backstory of Anandapur. Starting at the top, an exploration of each piece of the sign reveals the following. Seven Summits – A mountain trekking service that does not actually exist within the park. Expanding beyond the borders of Disney’s Animal Kingdom, however, and we can find Frank Wells’ window on Main Street is for Seven Summit Expedition. Seven Summit Expeditions is a reference to his desire to climb the highest mountain on each of the seven continents. Bat Cliffs of Anandapur – Can be viewed along the Maharajah Jungle Trek trail, specifically from the Community Hall. Public Telephone and Restrooms – Both actually exist, in the guise of the structure housing a bathing fountain, and can be found near the entrance to the Maharajah Jungle Trek. Maharajah Jungle Trek – Bats, tigers, and birds, oh my! If you’re not sure where this actually exists, just follow the big red arrow. Kali River Rapids and Kali Rapids Expedition – Kali River Rapids is the attraction, but Kali Rapids Expedition is the company that is home to Kali River Rapids. Their offices can be ventured through in the queue for the wet rafting journey. Anandapur Rail Service – Home to the former Royal Anandapur Tea Company, the Anandapur Rail Service, and its route from Serka Zong to all points beyond, has been put back into service by Himalayan Escapes, otherwise known as Expedition Everest. Anandapur Woodcarving – While not a place you can visit, the idea planted here is that there are handicrafts and a cultural identity to be found in Anandapur. Bi-Cycle On Hire – When thinking of transportation in Asia, more often than not thoughts turn to the lasting images of the pedaling people. Bikes have, for a very long time, been the transport of the masses, and can be found all throughout the Asia of Disney’s Animal Kingdom. Himalayan Escapes – Tied to the Anandapur Rail Service above, Himalayan Escapes is the company that dares to challenge the Forbidden Mountain and its occupant with their excursion known as Expedition Everest. Flying Yak – Until Disney’s Animal Kingdom creates a prop plane adventure for Asia, this company only serves to showcase how modernized the area is. Manam Travel and Tours (P) Ltd. – With so many vast wild places to explore in and around Anandapur, it is no wonder that the there are multiple travel groups in the area. This one, however, cannot be found within the borders to help you plan your next trek. Shangri-La Trekker’s Inn & Internet Café – While a physical building located near Himalayan Escapes/Expedition Everest does exist with this name, the only piece of the building we can visit is the public restrooms. A little random tidbit...There is a Russian passenger jet in operation called the Як-42. "Як" could be pronounced something like "yak". So...there really is a flying yak, just not in Animal Kingdom.